Very pretty card.Thanks for joining us at the Craft-Dee BowZ Challenge this month. This is gorgeous! LOVE it! So elegant! Thank you so much for sharing this beauty with us at Stamp and Create! Good luck! Fabulous card, love the glitter! Thanks for playing with us at Merry Monday! Gorgeous! Thanks for playing the "Anything Goes" Merry Monday challenge this month! This is truly beautiful, I love the simplicity of your design. So elegant!Thank you for joining us this week over at Love to Create Challenges! Oh I absolutely love a white on white Christmas card. So elegant. Thanks for joining us at Merry Monday. 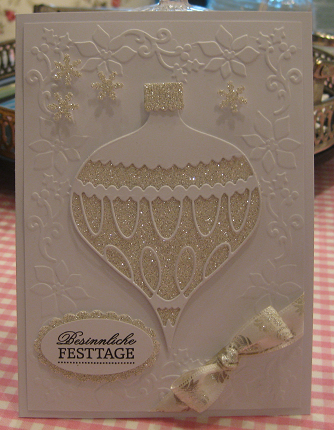 Beautiful card, your ornament is so pretty. Thank you for joining us for Merry Monday.